There was water only a few kilometres away, over the ridge directly ahead of them. The only problem was that it was guarded by lines of entrenched Turkish soldiers. If the horses were to be watered they would have to fight for it. Late in the afternoon, the decision was taken for the Light Horse to attack. Usually, the Light Horse would fight by riding up close to the enemy, dismounting then storming the trenches like infantry. With darkness approaching there would be no time for that. The Light Horse would have to charge like the cavalry of days gone by, and just so everyone got the message, they were ordered to sling their rifles across their backs and hold their bayonets in their hands like swords. The men hauled themselves into their saddles and began to form up. At 4:25pm, the Light Horse Regiments were in position just behind the crest of a ridge. There were 800 men, drawn up in three lines, each one just over a kilometre across. As always, unarmed mounted stretcher bearers would ride alongside the troopers into battle. Among the stretcher bearers was a shortish, athletic looking man, conspicuous by his thick biceps and muscular shoulders. His name was Albert Cotter, although he had always been known as ‘Tibby’ to his mates and family. Tibby was a natural for the role of stretcher bearer. Fearless under fire, his stamina and powerful physique helped him carry wounded men from the battlefield for hours at a stretch. Just a few weeks before, Tibby and his colleagues had worked all day under heavy shelling to tend to over 200 stricken comrades. There was something else that was different about Tibby – everybody knew who he was. Tibby was a famous sportsman who had played Test cricket for Australia. As the sinking sun began to cast shadows over the dunes, horses whinnied and snorted, their nerves taut like the troopers riding them. Waiting there for the order to charge, some men would have mulled over their own fates. The call-and-response “Are we downhearted? No!” might have passed across Tibby’s mind. He had heard it ten years before, on another occasion when his nerve had been put to the test. That had been in December 1907, when Tibby was destined to play a crucial role in one of the most nail-biting Test matches of all time. The first Test Match of the 1907/08 Ashes series, that began at the Sydney Cricket Ground on 13 December 1907, was eagerly anticipated. Even Dame Nellie Melba turned up to watch on the first day. The match was a close-fought one. England trailed by 27 on the first innings and made 300 in the second, setting Australia a target of 274 to win the game. After almost two days of rain, Australia resumed their run chase at 3/63 – still 211 needed to win. With the uncovered wicket sure to be ‘sticky’, all bets were on England’s bowlers wrapping up the innings quickly. Sure enough, the wickets began to fall and at the lunch break Australia was 6/142. When the seventh wicket fell at 185 all eyes in the dressing room turned to the 23-year-old Tibby. Who knows what state his nerves were in when he made the long walk from the members pavilion out to the middle. The crowd knew what to expect. When Tibby was batting it was either a six or out. In the first innings, Tibby had been bowled for a duck trying to the hoist the ball into the Showground next door. When the first ball was bowled to Tibby something remarkable happened, he let the ball go. When three consecutive deliveries were left alone by Tibby, one wag on the hill shouted, “Now Tibby, you block ‘em I tell you.” Slowly and surely, the score crept towards 200. Over in the city, crowds following the action on huge scoreboards outside newspaper offices began to chatter excitedly. Not an insubstantial number of them headed out to the ground and the crowd began to swell. Inside the ground, fans leaned forward a little closer in their seats. Australia lost their eighth wicket at 219, still 55 runs short of victory. Debutant Gerry Hazlitt now joined Tibby and with nothing expected of last man Saunders, it was down to these two. The English bowlers moved in for the kill. “No!” came the crowd’s thundering response. Then at 8/260, with just 14 runs to win, tea was taken. It would be hard to imagine a more nerve-wracking tea interval at the Sydney Cricket Ground. Would Tibby and Hazlitt even have sat down or were they pacing to and fro? Perhaps the last man in, Saunders, was the most nervous of all. Shortly after play resumed, Hazlitt had to dive full length to avoid being run out. When they required just six for victory the crowd could barely watch. “Fever heat” is how the contemporary reports put it. Just one scoring stroke from Tibby could win it. He hit the ball for three, giving the strike to Hazlitt. The noise in the crowd died down to absolute silence – then Hazlitt cracked the next ball to the boundary giving Australia an unlikely victory. The cheers that came from the crowd at that moment were like nothing the SCG had seen. Men shouted and ladies shrieked. Hats were tossed into the air and parasols were waved up and down. The grandstands rocked as people stomped on the wooden boards, unable to contain their excitement. Strangers shook hands and embraced. Down at the boundary fence, Tibby and Hazlitt were lifted high into the air. Winning a Test match with the bat was an unlikely achievement for Tibby since he was picked purely for his bowling. Even in this match he had taken six wickets in the first innings and the ball he bowled Barnes with was so fast it snapped the off-stump in half. It was as if his whole life had been geared towards him opening the bowling for his country. Tibby was born in Sydney on the 3rd December 1884. He was the youngest of six boys, born to Scottish immigrant parents, John and Margaret Cotter. The family business had done well, and by 1891 the Cotters moved into their newly built home, Monteith, in the Sydney suburb of Glebe. Monteith was a two storey brick mansion with substantial grounds and had its own stables. Twenty guests could sit at the dining table and often did since the Cotters were great entertainers. Elsie the housemaid used to surreptitiously keep a count of hats on the hatstand to know when dinner should be served. The Cotter boys excelled at every sport they turned their hand to. Norman was a gymnast so skilled he could walk up and down the Monteith staircase on his hands. Jock was a top notch cricketer. Part of the stables were modelled into a gymnasium where the Cotter boys built up their strength. All of them were keen boxers and they weren’t the kind of boys you would knowingly give offence to. But it was at cricket that the youngest boy, Albert, always known as Tibby, outshone all his brothers. As the years went by and Tibby’s muscular physique developed, he learned to bowl fast. Real fast. For his final years of schooling, Tibby was sent to the prestigious Sydney Grammar, no doubt in part for its sports programme. It was here that Tibby put the wind up schoolboy batsmen during the summer and tore up the Rugby field in the winter. 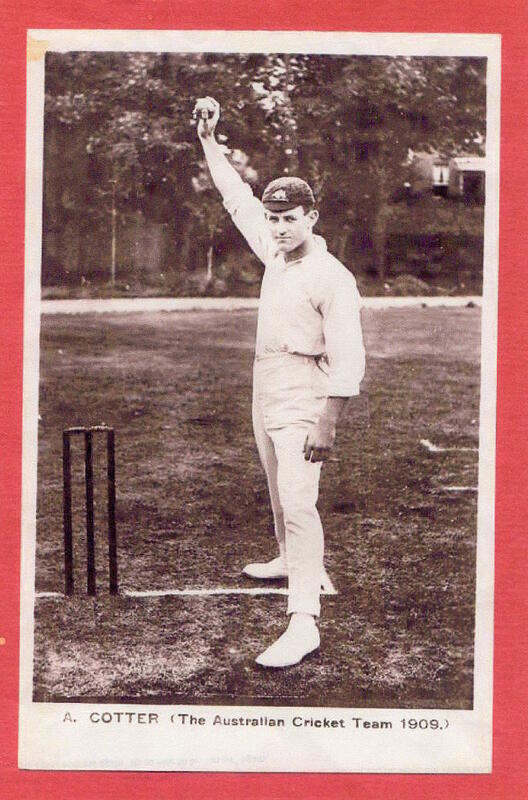 In 1899 and 1900 Tibby played for Sydney Grammar against its Melbourne counterpart. Although his bowling was described as ‘fast but erratic,’ he took a bag of wickets. With schooling finished, Tibby was ready to throw everything into his sporting career. It was now the turn of Sydney’s grade cricketers to deal with Tibby Cotter’s thunderbolts. The 20-year period leading up to the First World War were the halcyon days of Sydney grade cricket. Players lived and often worked in the district they played for. Spectators knew the players by sight or lived in the same street. Crowds of up to 10,000 would pack Wentworth Park on a Saturday afternoon to watch Glebe play their home games. And there was no team any self-respecting resident of Glebe would rather beat than their cross-town rivals, Paddington. 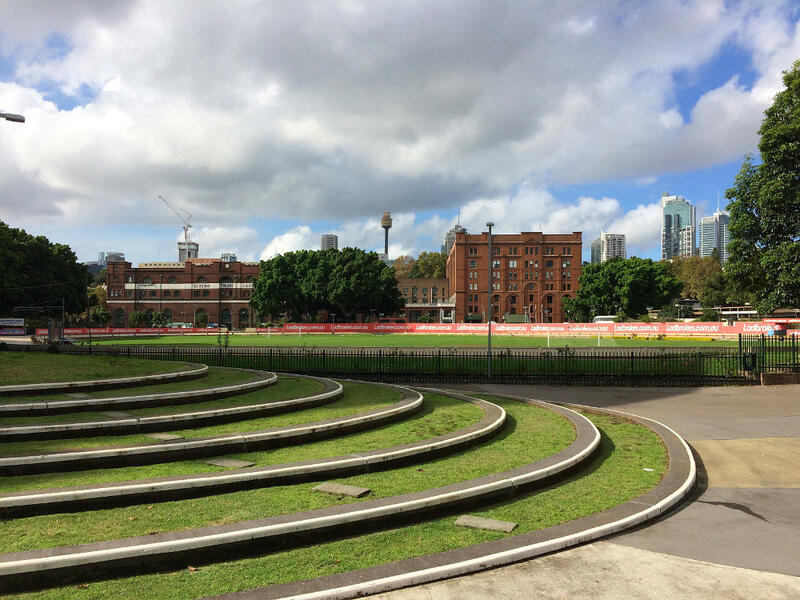 Glebe versus Paddington in cricket was perhaps Sydney’s earliest and fiercest sporting club rivalry. By 1900, Tibby had become part of this competitive cricketing environment when he was selected to play for Glebe. 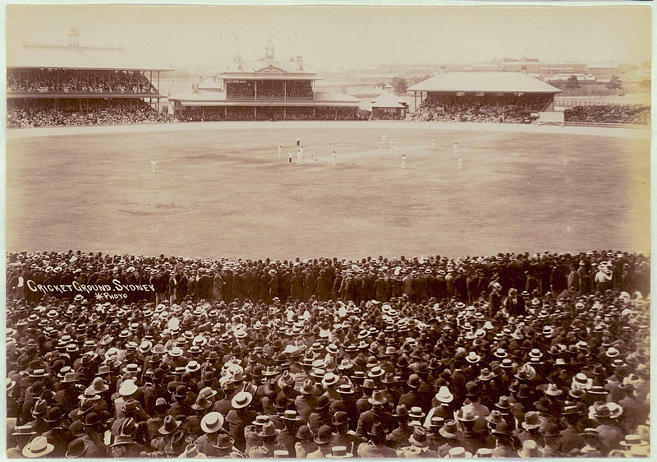 Before long, and if representative commitments allowed, watching a match featuring Cotter for Glebe going up against Victor Trumper’s Paddington, was a special event on the Sydney sporting calendar. One such occasion was a game beginning on 23 October 1904, when around 4,000 people crammed in to Paddington’s tiny Hampden Park. Much to the crowd’s satisfaction, Paddington won the toss and batted. Trumper took strike for Paddington, Tibby took the new ball for Glebe. The crowd was tense when Tibby sent down the first ball, an express yorker on leg stump that would have tested most batsmen in the world. Trumper merely flicked it off his toes to the square leg fence for four. The spectators side on to the wicket remarked on how fast the delivery was. Some of Paddington’s top order hoped that Trumper would bat for a long time. Trumper hooked two of Tibby’s short balls into the Chinese market gardens on the leg-side boundary. Tibby replied with a blistering yorker on leg stump. This time Trumper misjudged it and the ball snapped the stump in half with a crack that could be heard in the pavilion. In the end it was honours even. Trumper scored 55 and Tibby had bagged a five-wicket haul. They may have been rivals that day but soon became close friends. Tibby’s fast bowling exploits in grade cricket were legendary. Shattering stumps was a regular occurrence. It was said that one day at Wentworth Park, he bowled a ball that struck the wicket so hard, a bail cleared the boundary fence on the full. As a batsman, Tibby was a pure entertainer. He tried to smash every ball to the fence. His highest grade cricket score of 152 against Waverley came up in 85 minutes and included 16 sixes. At Wentworth Park he scored 121 against Waverley in 64 minutes. Against Western Suburbs he scored 71 in just 19 minutes. In those days, balls faced were rarely recorded, however in a tour match against Leicester in 1909, Tibby scored 35 runs off just 9 balls. While Tibby was building up his stocks in Sydney Grade cricket he wasn’t idle in winter. Tibby had become an exceptional centre-three-quarter for Glebe’s first grade Rugby team. He was a strong tackler, good runner, was the team’s goal-kicker and was known to score the occasional field goal. If he wasn’t such a good cricketer, who knows what he might have achieved on the Rugby field. Although his bowling was still erratic, Tibby’s sheer pace could not be ignored for long and in January 1902, at the age of 17, Tibby was selected to play for New South Wales against Victoria. Tibby’s first foray into interstate cricket was less than memorable. Used sparingly by his captain, he only bowled 12 overs and didn’t take a wicket. His batting was worse, scoring a duck in each innings. It was a tough initiation but Tibby was made of stern stuff and more strong performances for Glebe earned him another call up for New South Wales against Victoria in January 1904 at the Sydney Cricket Ground. This time Tibby didn’t disappoint. He bowled lightning fast, finishing with match figures of 6/125. All four of his first innings dismissals were bowled. It was good enough to retain his spot for New South Wales against the touring English team. The match against England was a great opportunity for Tibby to impress the selectors. How would the erratic young speedster go? Within an hour Tibby had broken the back of the England batting, taking three wickets as the tourists slumped to 3/27. He finished the innings with a five-wicket haul and followed it up with three wickets in the second innings. His match figures of 8/100 were impressive enough. Soon, champagne corks were popping at Monteith in Glebe, because Tibby had been called up to play for Australia against England in the fourth Test. In his debut Test in Sydney, Tibby made a nervous start, finishing the first innings with no wickets but in the second innings his figures of 3/42 were the best of the Australian bowlers. In the fifth Test at the Melbourne Cricket Ground on a sticky wicket, Tibby was next to unplayable, his figures of 6/40 helping to rout England for 61. Few at the ground had seen bowling as fast as this. Tibby had a slinging action, and combined with his powerful shoulders, was able to deliver the ball at express pace. Good judges considered him to be the fastest bowler in the world at the time. In his first match on tour, Tibby struck the legendary cricketer WG Grace a painful blow on the hand. When a nervous WG spooned a catch soon after there were murmurs that Tibby’s bowling was not in the spirit of the game. Tibby’s reputation was made. The Australians played 35 first class matches on the 1905 tour and Tibby’s record was impressive, taking 124 wickets at an average of 19.33. He played in three of the five Tests, taking 13 wickets at an average of 32.84 including a career best 7/148 at the Oval. 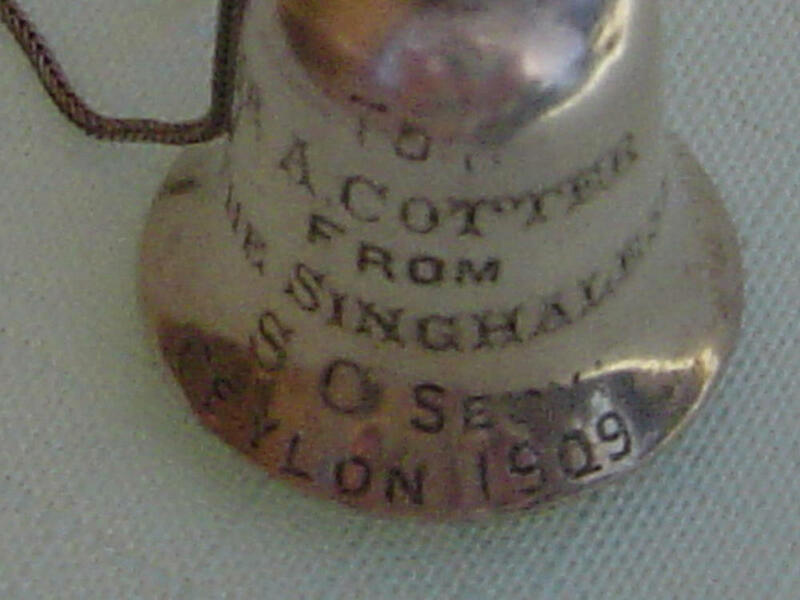 Tibby played in the 1907/08 Ashes series which included his memorable batting feat. He also represented his country against New Zealand and South Africa. On the Australian tour of England in 1909, Tibby had first a class bowling average of 29.09. In the third Test at Leeds he put in one of the greatest bowling performances of his career. Set 214 to win, England were bowled out for just 87, Tibby, with 5/38, being the main destroyer. Few at the ground had seen bowling as fast as this. He was popular with his teammates and was always up for a laugh. At an overnight stay in Scotland, Tibby organised for two local fisherman to stand in for the usual local dignitaries. The subsequent song in Gaelic, with the touring team attempting a Highland jig, was regarded as one of the comedic highlights of the tour. This humour may be lost on us these days but Tibby Cotter was an Edwardian joker of the first rank. He was also a hit with the English fans, due for the most part to his dashing style of play, but also in some part to his athletic physique and good looks. Tibby’s good looks no doubt played a part in a passionate affair which he was rumoured to have had with a barmaid at the team’s hotel. The 1912 tour of England was to feature a tri-series of Tests involving South Africa but Tibby, along with five other leading players, boycotted the tour due to a dispute with the Australian Board of Control. Tibby played 21 Tests for Australia, taking 89 wickets at an average of 28.64. It was claimed that if Australia had a slips fielder the calibre of Tibby’s brother Norman, then Tibby’s figures might have been even better. The onset of World War 1 in August 1914 put paid to any chance of a comeback and in April 1915, Tibby enlisted in the AIF. It was a close run thing since Tibby’s short-sightedness was so acute that these days his condition would be described as legally blind. Perhaps this was why his bowling was at times so erratic. It ruled him out of a combat role, but his physical strength, and possibly his name, allowed Tibby to be enlisted as a stretcher bearer in the Light Horse. Tibby Cotter was arguably the most famous sportsman in the country to enlist. Pictures of Tibby in uniform soon began to circulate in the newspapers. It was great publicity for the AIF recruitment campaign. While still undergoing military training in Sydney, Tibby’s great friend, Victor Trumper, died of Bright’s Disease, aged just 37. His funeral procession on the 30th of June 1915, was said to be the biggest Sydney had ever seen with some 20,000 people lining the route to Waverley cemetery. Tibby was one of the pall-bearers and helped lower the coffin into the grave. In a rare departure from the ‘stiff upper lip’ reporting of the day, one Victorian newspaper let slip that cricketers Monty Noble and Warren Bardsley were sobbing as the coffin was being lowered. Tibby must have struggled with his own grief as he looked out past the gravestones and across to the sweeping expanse of blue Pacific at that cemetery by the sea. Two months later, the SS Runic sailed past that very spot on its way to Egypt. On board were reinforcements for the 12th Light Horse regiment including the Test cricketer, Trooper Albert ‘Tibby’ Cotter. The Light Horsemen on the Runic disembarked in Egypt and continued their training. They were then sent to Gallipoli to fight as infantry, arriving there in November 1915. At Gallipoli, Tibby managed to do something that would rank favourably alongside the exploits of touring Australian cricketers on long-haul flights years into the future – he got drunk. Now Gallipoli was not the kind of place you could just walk up to a pub and buy a beer. It was remote and desolate, and in 1915 was more fit for rats than humans. Yes it was insubordinate but at the same time showed a certain kind of initiative. Tibby spent five days in the slammer at Anzac Cove hoping a Turkish shell wouldn’t land on him. Towards the end of December, the Light Horse regiments were evacuated, being among the last units to leave Gallipoli. The Light Horse returned to Egypt and early in 1916 Tibby was lucky enough to catch up with his older brother Jock, who had enlisted in the infantry and was in transit to the Western Front. Tibby served in Egypt, Sinai and Palestine, and anytime a cricket match was organised someone would come to fetch him to play for them. Due to his tireless work and bravery under fire, Tibby was rewarded with a promotion in 1917. But responsibility didn’t sit too well with him. He had willingly obeyed orders to stonewall to help win the First Test in Sydney in 1907, he had decimated England’s second innings in Leeds when requested by his captain. He was popular with the men but the thought of giving them orders must have weighed on him. Eventually, Tibby requested that he be returned to the ranks, and after a spell of just three weeks, Lance Corporal Cotter went back to plain old Trooper Cotter. In the second half of 1917, on a scorching day in the desert of Palestine, not far from Mt Sinai, a curious cricket match was taking place. One team represented England and the other Australia. The participants referred to it as a Test match. The English team consisted entirely of officers and took to the field in neatly pressed cricket whites. The Australians were wearing the blue-grey tunics and khaki breeches of the Light Horse. The Australians were sent into bat and were bowled out for the miserly score of 50. The English players were buoyant at the interval, speculating how long it would take to knock over the 51 runs needed so they could head back to the base for refreshments. There was no question that they wouldn’t win. Surprisingly, the Australians didn’t seem too downhearted when they came out to field. Douglas, the English team’s captain almost chuckled when the ball was tossed to a shortish, muscular man of around 30 years of age, with a black beard ‘as thick as pard.’ As this wild looking colonial boy came into bowl, Douglas could taste the gin and tonic. The first he knew about the opening delivery was the sound of the stumps being smashed. He hadn’t seen the ball at all. When the next batsman was clean bowled first ball, a ripple went through the English team. One after another, the English batsmen were skittled. At the end of the innings their score totalled up to a miserable four runs. The bearded fast bowler had taken 9 wickets for 2 runs. When it was revealed that the mystery bowler was indeed Tibby Cotter, a great laugh was had by all. It would be Tibby’s last international cricket match. A few weeks later, Tibby sat astride his horse behind a ridge, waiting for the order to move. At 4:30pm, on the 31st October 1917, with just half an hour of daylight left, the order to move forward was given and Tibby and the rest of the Light Horse crested the ridge at a walk, and the battlefield of Beersheba came into view. Fortunately for them a dangerous machine-gun position had been put out of action by New Zealand mounted troopers earlier in the afternoon, but nevertheless, from their right, came the deadly rattle of a machine-gun opening up on them. Immediately to their left came a deep boom as British artillery battery fired on the machine-gunners and silenced them. By this time the Light Horse was close to a gallop, their hooves making a noise like rolling thunder. In the fading light, orange flashes of Turkish rifle and machine-gun fire from the trenches ahead could clearly be seen. The Turks in the trenches in front of Beersheba began preparing for the oncoming horsemen to dismount. But instead, they kept coming at the gallop, the riders screaming out “Coo-ee” and brandishing their bayonets like cossacks of old. As they came to the Turkish lines, the Australians jumped clear over the trenches, capturing the town and its vital wells and at the same time winning a decisive victory for the allies. But Tibby didn’t survive the battle. Trooper ‘Woz’ Glazebrook, from Double Bay, told the Sydney newspapers that he saw Tibby’s horse baulk at jumping a trench and Tibby dismount to coax the horse across. It was then that Tibby was shot in the head at close range. Years later, another version of Tibby’s death emerged. Tibby had seen a Turkish gun crew unlimbering their gun and retreat back towards the town. Tibby galloped after them and forced them to surrender. Realising that their captor was unarmed, one of the Turks picked up a pistol and shot Tibby in the back of the head. Mr and Mrs Cotter were informed of the death of Tibby on the 17th November. Two days later they received news that their other son, Jock, had been wounded. A month later, Jock was listed as missing. Finally in March, 1918 they were told that Jock had been killed in action on the 4th October, a few weeks before Tibby’s death. More tragedy followed for Mr and Mrs Cotter. During the 1920s, two of their sons were killed in separate train accidents. In the lunch break of a Sheffield Shield match in January 1919, a ceremony was held to unveil the memorial plaque for Victor Trumper at the Sydney Cricket Ground. The tribute to Trumper, previously postponed due to the war, had been expanded to also include his great mate, Tibby Cotter. Dignitaries, famous ex-cricketers and members of the Trumper and Cotter families gathered for the ceremony. The 22 players of the New South Wales and Victorian teams stood in silence, heads bowed. At the end of the ceremony, friends of Tibby placed a wreath beneath his memorial plaque. It was a perfectly clear February day, the sky a washed out blue, the kind you get in Sydney after a few days of rain. Crossing the road and madly scrolling through my phone for the correct address I was tooted at by a car coming up the street. In days gone by this could have been Mr Cotter in his buggy advising me to “watch where you’re going, you might scare the horses!” I waved my hand in apology and walked on. 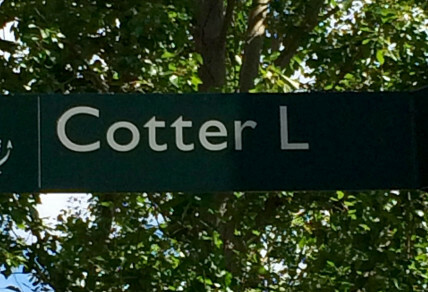 Up ahead in white letters on a dark green background was a signpost for Cotter Lane. Surely I was close now. It’s hard to explain and I don’t know why it happened, but I suddenly felt the tingle of goosebumps on my arm. Perhaps this was how batsmen felt when they came out to face a fired-up Tibby after the fall of a wicket. Perhaps this was how Tibby felt just before the Battle of Beersheba. On the other side of the lane I saw it. Beyond a graceful wrought-iron fence was the childhood home of Albert ‘Tibby’ Cotter, its red brick tinted gold in the morning light. I didn’t need the map since ‘Montieth’ was clearly visible on a plaque. The sun was throwing dappled shade from a gum tree over the upstairs balcony where the Cotter boys would have leaned over hundreds of times. It was here that the young Tibby had run from room to room playing with his brothers. It was here that the shouts and laughter of the six boys and the thump of Norman walking up and down the stairs on his hands would be heard when you passed by. On a Saturday, the boys would be getting ready for sports, cricket in summer or Rugby in winter, with all the noise that goes with that. Adolescent and teenage boys calling out, perhaps with Mrs. Cotter chiding them or hurrying them up to get ready in her Scottish brogue. Imagine the celebrations when Tibby was first chosen to play for his country! There must have been a party with laughter and music and the sound of tinkling glasses as toast after toast was made to Tibby. Poor Elsie the housemaid would have been run off her feet! The sound of an older Tibby keeping his adoring sisters-in-law amused as they laughed and laughed at his antics. It was also here in November 1917 that a messenger approached the house, clutching a cablegram with grim news. And, for once, and for a long time afterwards, the house fell silent. Image Credit: All images are Copyright 70s Mo, unless otherwise noted.